Cramming For A Debate: Canidates John Choi (left) and Mitch O’Farrell read up at school desks before debate begins in the auditorium of Dorris Place Elementary. Council District 13 rivals John Choi and Mitch O’Farrell on Tuesday night repeated some common themes during a debate in the final week of the campaign, with O’Farrell touting his deep roots in the district and extensive knowledge of neighborhood issues while Choi called for a broader vision and the ability to work across council district boundaries to improve conditions for the 13th district. Seated behind classroom desks topped with flowers and nameplates, Choi, a labor organizer and former Public Works Commissioner, and O’Farrell, a former senior staffer for termed-councilman Eric Garcetti, were cordial for the most part during the approximately 90-minute debate as they stood up to respond to questions in the auditorium of Dorris Place Elementary in Elysian Valley. But there were at times signs of tension between the two candidates, whose campaigns have traded charges of voter fraud and race-baiting in the final weeks before the May 21 city election. Choi, however, said focusing attention away from a City Hall staff would shortchange the district in the end. 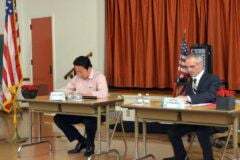 “I think it’s incredibly important to have a robust City Hall presence because those are the folks that move the gears of the bureaucracy in order to get resources for your district,” Choi said. Despite some tense moments, the two candidates quickly shook hands at the end of the forum. Choi said it was important to have a robust City Hall staff to help find resources for the district. O’Farrell said he would hire more staff in the field than at City Hall to handle constituent services and quality-of-life issues. * Correction: A previous version of this story described O’Farrell as white. That’s wrong or at least half wrong. O’Farrell his half white and half Native American.